Developing Your Film Festival (DYFF) is the world’s only intensive development programme for film festival professionals. If you want the next edition of your film festival to have a bigger audience, stronger international reputation and improved sponsorship and partnerships, this course was designed for you. The programme is 100% recommended by all previous participants, which include over 170 film festivals from around the world. DYFF 2019 is taking place at New Horizons Film Festival from 22-28 July. Here you will have the chance to see the beautiful Polish city of Wroclaw, one of the most incredible festivals in Europe, and home to the largest arthouse venue in Europe which plays host to the festival. If you want to be next to discover the secrets of success from top film festivals, then apply to Developing Your Film Festival by 16 May 2019. 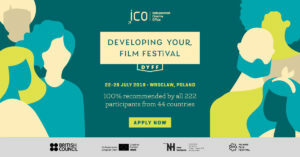 The training programme is funded by Creative Europe and supported by the British Council, New Horizons International Film Festival and Vilnius International Film Festival. The course is taught interactively by experts from the Independent Cinema Office as well as key festival staff from the best festivals from around the world (including representatives in the past from Berlinale, Hot Docs, Rotterdam, Toronto and many more have ). You will come away with a clear strategy that you can implement immediately, as well as new contacts from festivals around the world. The fee for attending DYFF19 is €1250. This includes accommodation, course materials, film festival accreditation and some meals. There will be scholarships and bursaries available to make it easier for you to attend. Please note, due to funding agreements, priority for scholarships will be given to film festival professionals working for not-for-profit organisations with an annual turnover of less than €400,000 from low capacity countries or non-EU countries that participate in the Creative Europe MEDIA Programme. This Scholarship is also open to freelance film festival professionals whose financial circumstances would otherwise prevent them from participating in the training. In order to qualify for travel support, applicants need to live at least 50 miles from the course location. No travel expenses will be payable without official receipts. If you have any further queries or would like to apply for a scholarship, please contact training@independentcinemaoffice.org.uk. 100% of participants questioned said they would recommend DYFF to a colleague or peer. 100% of respondents said the course was ‘very relevant’ or ‘relevant’ to their job and career development.